Our Yalah Surf Hostel, a family house with shared, double and private rooms. Our surf house is a special place, where good vibes and happiness are always in the air. Therefore located only 50 meters from the ocean, the surf house is as central as can get and just minutes away from the restaurants, markets and massage places. Enjoy a nice cup of tea or just walk around and enjoy yourself. If you want to buy something (especially souvenirs), prepare to barter for it. Bartering is part of our local culture and it’s a respected tradition. PS: Our surf house can fit up to 20 guests and our rooftop terrace has some of the best views in Taghazout. It’s decorated in customary Moroccan style with exceptional views. From here, you can see well-known surf spots such as Panorama Point, Hash Point, and Anchor Point, all within a 5-minute drive! In fact, we’re located less than 50 meters away from the surf spot Hash Point. Our house is a classic surf house. It’s shared with other surfers who live together and contribute to the constant good vibes and relaxed, family-friendly atmosphere. Taghazout was originally a fishing village and it’s still a genuinely Moroccan place. Now, Taghazout is known for being the best place to surf in Morocco! rich in culture and traditions. 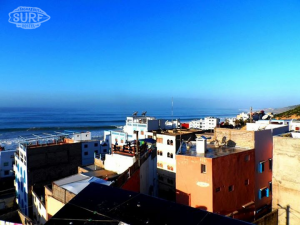 This surfing capital of Morocco is a small and relaxed village situated about 20 km from Agadir. There are several world-class surf spots within walking distance of the camp and the area gets 330 days of sunshine per year, which becomes clear when you discover your environment; you’re actually on the edge of the Sahara Desert! We have one apartment available next door to the house. This is perfect for couples or families that want some privacy while still being able to chill at the house with other explorers. The apartment fits 2-4 people.. NB: Unfortunately, our apartment is only available during the high season. Staying in a shared room with 4-beds is the best way to meet and get to know other people. There are two double or twin rooms in the house.